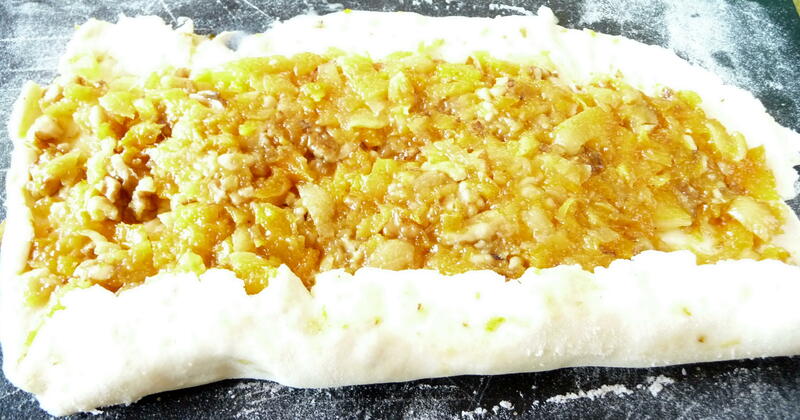 I had some trepidation about the “strudel” part of this week’s recipe. 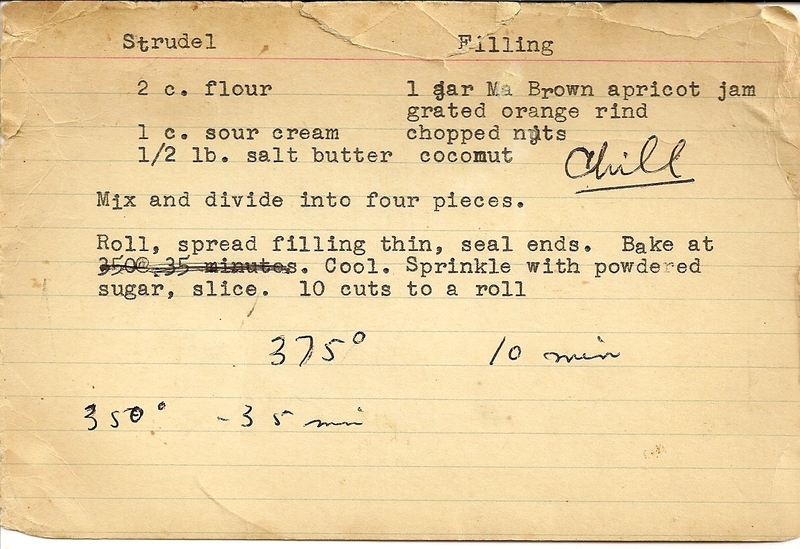 When I found my grandmother Jessie’s lost files, I noticed the “apricot strudel” recipe but did not pay close attention, which turned out to be par for the course for me with this recipe. The rolling of this strudel into a log is very easy. The reason for my fear-of-strudel dates back to a cruise we had taken a few years back with my mother, from San Francisco to various Pacific ports in Mexico. On this sailing, an Austrian chef demonstrated making apple strudel. A traditional strudel includes stretching, more stretching, and, when you think you have stretched the dough enough, stretching yet again. So I thought I would have to do all this stretching and was a bit worried about this technique. However, this recipe has no stretching. The dough is very easy to make. 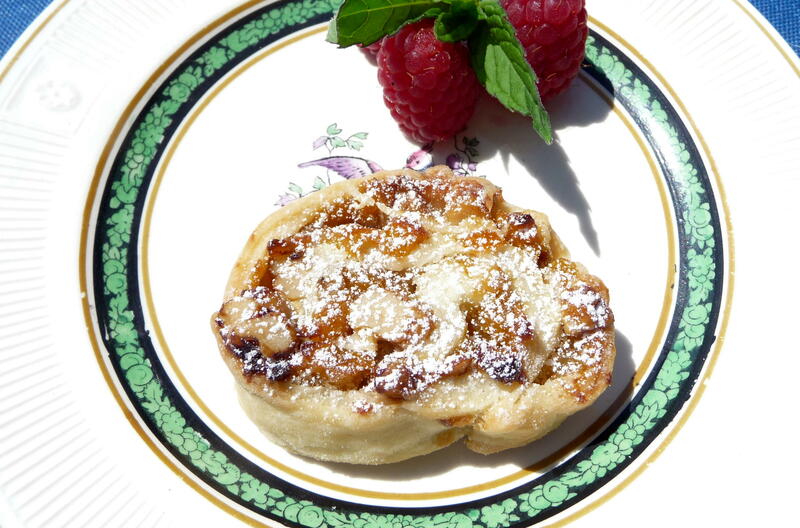 This pastry is more akin to a rugelach than a strudel, as the dough for the former usually features either sour cream (as does this) or cream cheese in addition to nuts and cinnamon in the filling. Rugelach often has raisins, but I used dried apricots in this version. Either way Jessie’s apricot strudel is very mittel-European and very Old World in its sour-cream-butter dough, with an apricot-nut-coconut filling. I vaguely remember Jessie making a cookie similar to this. Perhaps I do not recall it very well, given that it is not a terribly sweet cookie – and without chocolate. Hence, I would not have been too interested in it as child. Though Jessie loved eating traditional flaky apple strudel, she also liked rugelach. For Sacher torte or other rich desserts, Jessie always liked her café mit schlag (coffee with whipped cream), as she called it, to ensure the most extravagant dessert experience possible. 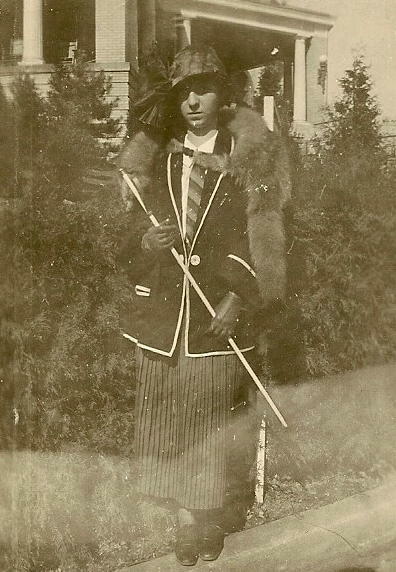 In 1923, Jessie is very stylish in an Old-World way, while on honeymoon at a resort in French Lick, Indiana. My challenge with this recipe was that Jessie called for “Ma Brown apricot jam”. I do not know if this exists any more, but I prefer to use my own preserves, whenever possible, regardless. I had only one small jar of apricot butter left from the small batch I made last year, but this amount would not have sufficed.